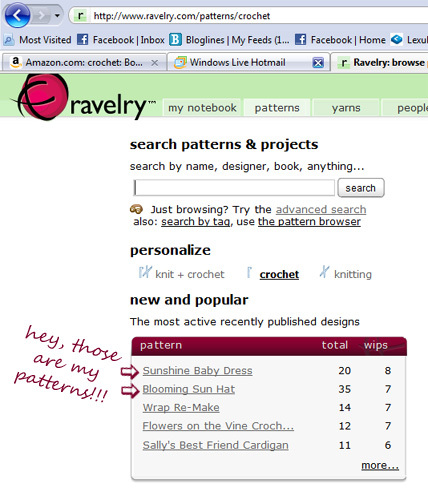 Two of my most recent patterns (both from Crochet Today, May/June 2010) are, at least for the moment, the top two most active crochet patterns on Ravelry! As a designer….ahem, as a designer who just had her taxes done and sometimes questions her career choice…. this is a great reward. It’s things like this that make me feel my work is worth it! But let me take this opportunity to talk about something that bugs me. It’s still totally depressing to me that the most active crochet patterns on this site might have 20 or 30 people making them (or at least, taking the time to mention that they’re making them), whereas the most active knitting patterns on Ravelry have numbers in the thousands! That’s where you come in. If you haven’t joined Ravelry, why not?! I, and I think many in the yarn industry, use it as a sort of pulse on what’s popular and interesting to yarn crafters and having more crocheters make their presence known can only help show industry folks that we crocheters are passionate about our craft. Plus, it’s an awesome (Free! Non-Spammy!) way to find inspiration and connect with your fellow crocheters. You can see if other people made a design you’re thinking about in a different yarn, if they have any helpful tips or modifications for designers, or if they got hung up somewhere–which might help you avoid the same mistake. I also love to use it to check out pictures of potential wearables on people close to my size so I have a true idea of whether or not they will work on my figure. And just so you know, I go to my designer activity page every day–among other things, it shows me when people posts pictures of projects made from my patterns. Sometimes I get sucked in to the working-at-home vacuum (thank goodness for my part time job at Yarnivore! ), but this website this really makes me feel connected to you all– my happy, creative crocheters! Which reminds me, did you know I have a fan page on Facebook? I won’t clog your home page as I only update once or twice a week, but I like to share when I have new posts and patterns, or when someone else posts about my patterns. Click here to “like” me. Thanks for continuing to support and crochet from my work, and keep the project photos and notes coming! our taxes were a super bummer this year, too. I've been on Ravelry for about two years now and absolutely love it. I both knit and crochet, I find I have different uses for each method :) I'm DreamyMama over there.